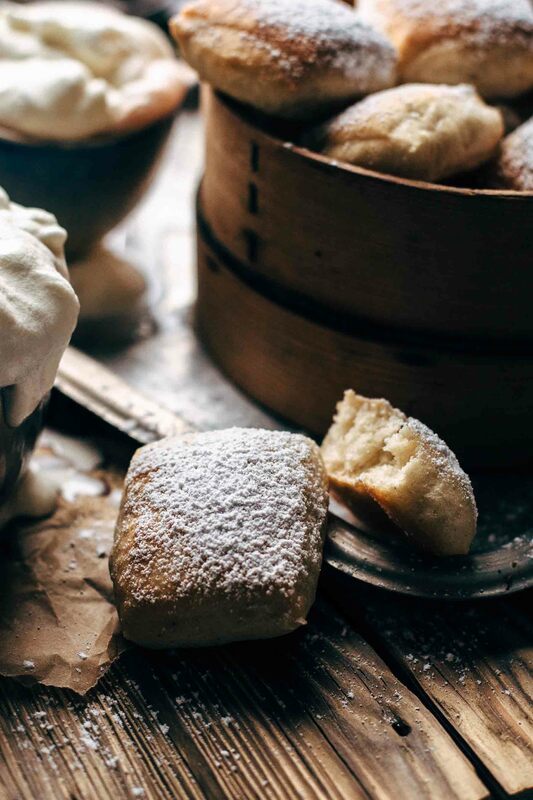 These Baked Buttermilk French Beignets are soft little pillows. Baked not fried! Super easy to make. With simple trick just 45 minutes rising time. Watch the video on how to make beignets. Beignets are great, aren’t they? 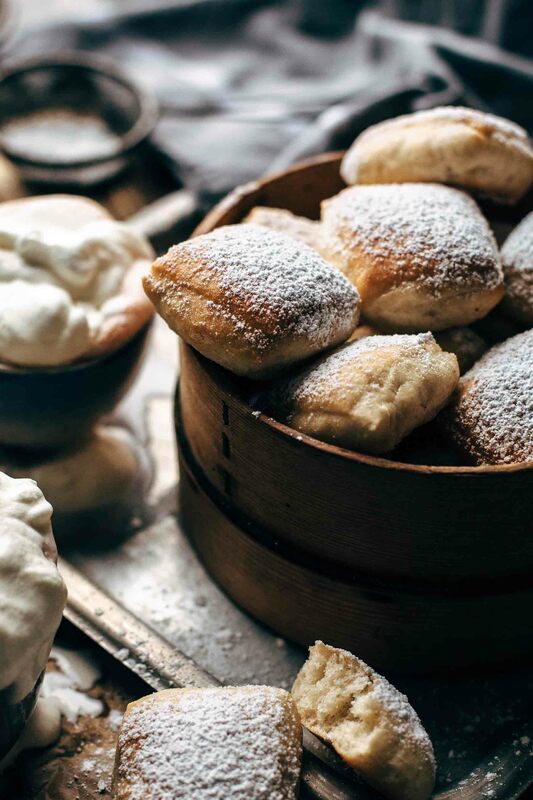 These soft little pillows are dusted with powdered sugar and to-die-for. 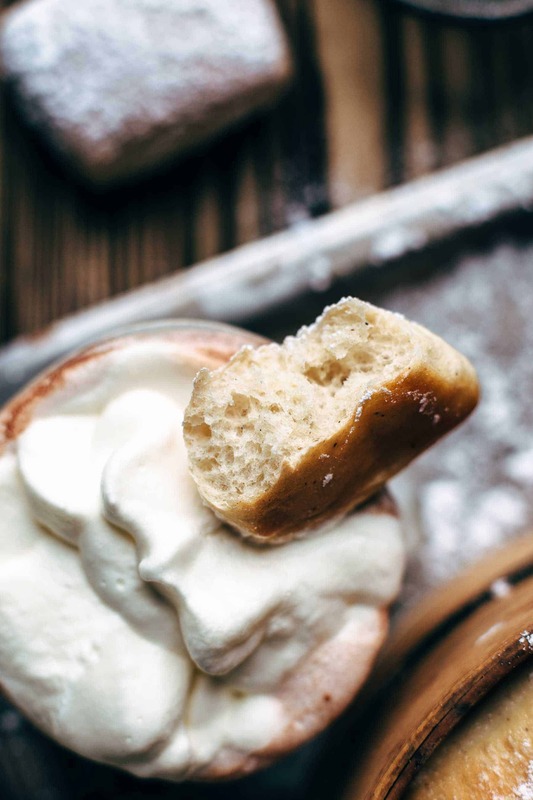 Although you can fill beignets with jam, chocolate spread, or whatever you are craving for, beignets taste great on their own without anything. I love to have them just with a cup of hot chocolate with a huuuuge heap of whipped cream on top. By the way. Beignets are pronounced ben-yay. Actually, they should be written ben-yay too because I’m super thrilled when I eat them and could scream *yay* all the time. You know what I mean? I’ve decided to use buttermilk instead of (evaporated) milk, and the result is fantastic. They are heavenly pillowy, soft, and moist. 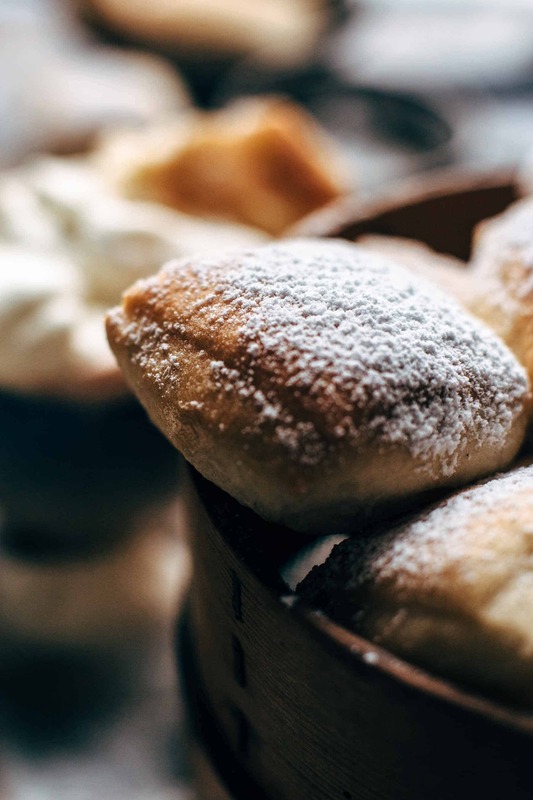 You will be obsessed with these Baked Buttermilk French Beignets recipe. Trust me. I prefer to make baked goods instead of fried ones. Don’t get me wrong. I love churros or donuts. But I prefer the handling of baked stuff. Speaking of donuts. There is a noticeable difference between baked donuts and fried donuts. The good thing about this beignets recipe is that there is not such a difference between these baked beignets and fried beignets. In fact, they are way better than the fried ones. After baking, brush them with melted butter and dust generously with powdered sugar. Once you bit into these fluffy and warm pillows, they immediately put a spell on you. You will make beignets on a regular basis from now. Ok, this question is fairly easy to answer. Watch the video, and you will learn how to make beignets. The video is less than 1 minute long. You need a bowl where you stir water, sugar, and yeast to combine. Then let sit for about 10 minutes. Add egg, buttermilk, salt, vanilla, and melted butter and mix until combined. Then switch to dough hook and add flour. Begin with 3 + 3/4 cups (450g). The dough should be a bit sticky to touch and shouldn’t stick to the bowl anymore. If your dough is too sticky, then add 1 tbsp flour after another until it has the required consistency. After rising roll to a rectangle or square with 1/4 inch (0,6cm) thickness. Cut into 2×2 inch (5x5cm) squares and transfer to parchment paper lined baking sheets. When they are baked brush with melted butter, dust GENEROUSLY with powdered sugar, and wait until they are not hot anymore. And then……put them into your mouth. You see? 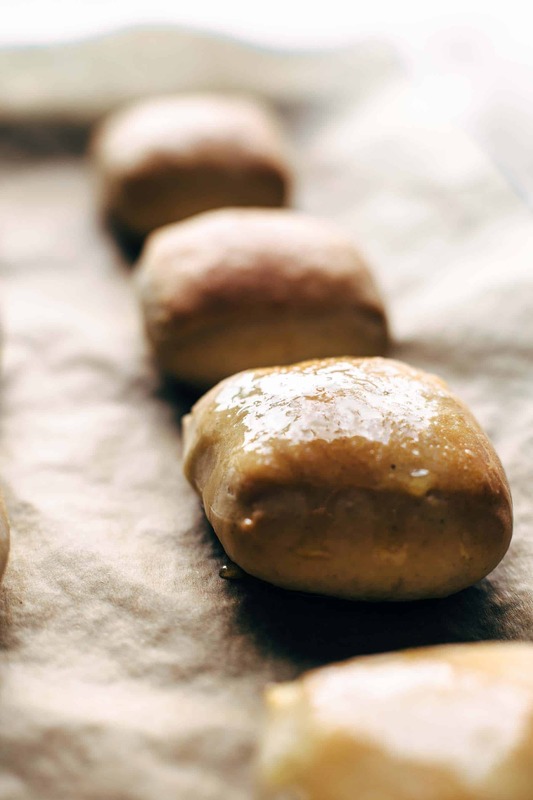 They are really easy and quick to make especially when you have a kitchen machine. You just need to add all ingredients to the bowl in the required order. Rolling out is easy peasy because you roll them once and cut them. Don’t re-roll them. Just 20 minutes active prep time. Thanks to my simple rising trick they just need 45 minutes to rise. These 45 minutes are enough. Believe me. Did you see the second photo? They are rising up to little jumbo-pillows. So what is now my super simple rising trick? Preheat oven to 200°F (100°F) while you make the dough. Then place dough into a lightly greased heat-proof bowl. Turn off the oven and put the bowl into the oven. Leave the oven door ajar. Let rise for 15 minutes. Remove bowl from oven and preheat again to 200°F (100°C). Then roll beignets dough out, cut, and place squares on baking sheets (I needed 3). Turn off the oven and put all 3 baking sheets into the oven. Leave the oven door ajar. Let rise additional 30 minutes. And then, puff, they are little jumbo-pillows. They rise by 4-5 times in size. 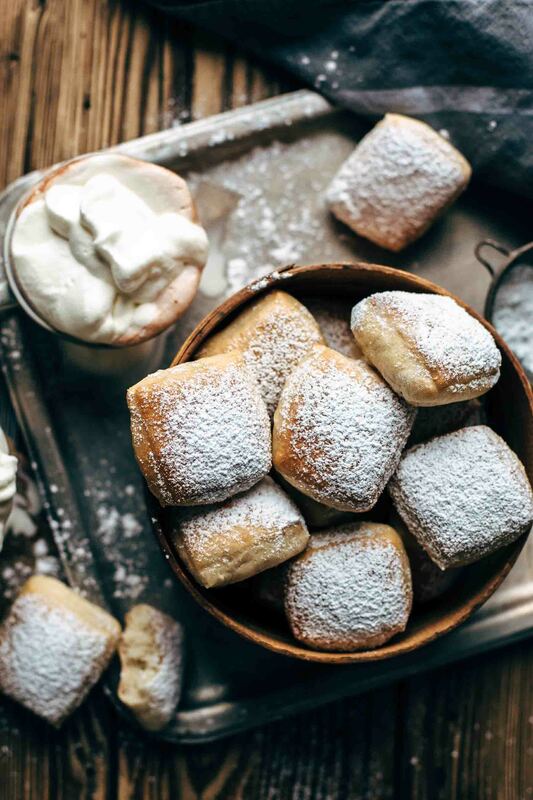 If you make this Baked Buttermilk French Beignets recipe, leave a comment, rate it and tag a photo #alsothecrumbsplease on Instagram! Would love to see your snap! In a large mixing bowl, using a stand or handheld mixer fitted with a whisk attachment, combine water, sugar, and yeast and stir to combine. Let sit for about 10 minutes until it starts to get foamy on the surface. Preheat oven to 200°F (100°C). Line 3 baking sheets with parchment paper. Set aside. Add egg, buttermilk, 3 tbsp butter, salt and vanilla* and whisk to combine. Replace whisk attachment and attach a dough hook. Add 3 + 3/4 cups of flour and stir on medium-low speed until the dough comes together. The dough should be a little bit sticky to touch but shouldn't stick to the bowl anymore. If it does stick to the sides of the bowl add 1 tbsp of flour after another mixing on low speed until you reach this point. Then turn on medium speed and knead for about 5 minutes. Transfer beignets dough to a lightly greased (brush a few drops of oil in a bowl or use a non-stick spray) heatproof bowl. Turn off preheated oven and place bowl in the oven to rise for about 15 minutes. Leave the oven door ajar. Remove bowl from the oven and preheat again to 200°F (100°C). On a lightly floured surface roll beignets dough out into a rectangle or square, about 1/4 inch (0,6 cm) thick. Cut 2-inch (5x5cm) squares with a pizza cutter. Place on prepared baking sheets. 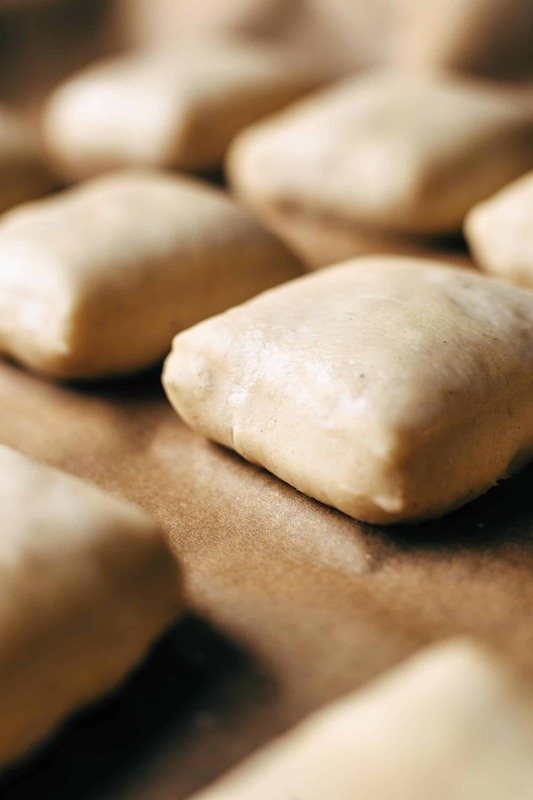 Turn off preheated oven and place all 3 baking sheets in the oven to rise for about 30 minutes until they are puffy like little pillows. Leave the oven door ajar. Remove baking sheets from oven and preheat to 375°F (190°C). Brush tops lightly with milk. Bake one baking sheet after another for about 10-12 minutes until light golden brown. Let cool for about 5 minutes then brush the beignets tops lightly with remaining melted butter and generously dust with powdered sugar. Beignets are best eaten warm and fresh. If you plan to eat them on the next day, you can warm them in the microwave for about 10 seconds if desired. Brush with butter and dust with sugar just before serving (otherwise, the tops get a bit moist). Store in an airtight container up to 2 days. I love beignets! These look absolutely amazing – so delicious! Thank you so much, Natalie! I love beignets too. They are so pillowy. Can I use bread flour for this? I used all-purpose flour for the beignets. I don’t recommend using bread flour for beignets because it leads into a chewy instead of light and airy consistency. As always Sabine your recipes are amazing and never fail in taste factor! I’ve been looking for an airy soft recipe that I can cut out as doughnuts and bake in the oven. I know that nothing can compare to an actual fried doughnut with all those gorgeous airy pockets. I was wondering which recipe you think has more of those qualities, this recipe or your baked yeast doughnut recipe? Also does this recipe stay soft for a while or does it start drying out after a day? Thank you so much, Antonella! I’m glad you like my recipes! 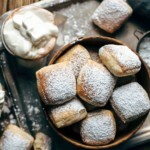 I would say these beignets are even more fluffy than my baked yeast doughnuts thanks to the buttermilk. They keep fresh up to 2 days in an airtight container at room temperature but of course, they are best eaten on the same day. Have a great day! I’m thinking of making these. I was looking for a baked not fried recipe. Less calories and I don’t have a deep fryer. Any other tips for this recipe? I’m a seasoned baker but a first for Beignets!! Thank you!. Hey Sherry, The number one tip I can give you is not to add too much flour. Too much flour makes the beignets dry. So stop adding flour until the dough is sticky to touch but starts to come off the sides of the mixing bowl. Hope that helps!